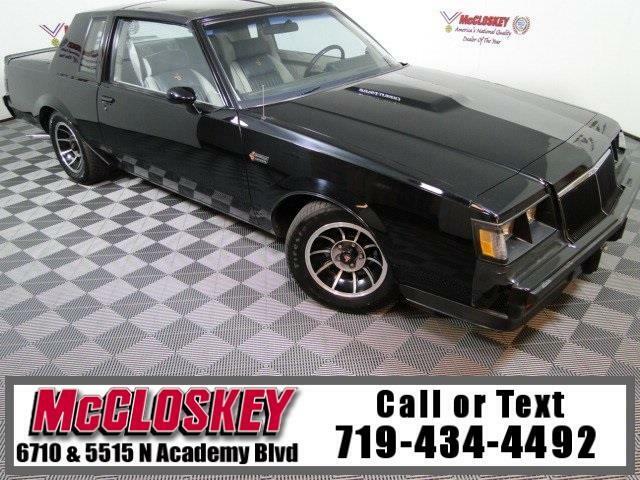 Immaculate 1984 Buick Regal T-Type Grand National with V6 231 Turbo Engine, Leather Seats, T-Bar Roof, Premium Sound System, and Cruise Control! This is a car that was very well loved by its past owner! Come take a seat in the driver's seat to feel the amazing power from this V6 turbo engine. The Grand National package is loaded with a lot of amazing features. This vehicle has been inspected in our service center and is in great shape for the year. We are an ''A+'' Better Business Bureau Rated Business. We offer low interest rate financing, low down payments and the highest trade allowances in the state! Here at McCloskey, we do things a bit differently, we shop our competition every day to ensure a great value to you. Come on down and experience it for yourself. At McCloskey, we strive to provide ASSURANCE, TRUST, VALUE, AND QUALITY! Call 719-434-4492. Visit Big Joe Truck Town - McCloskey Motors Inc online at bigjoeauto.com to see more pictures of this vehicle or call us at 719-434-4199 today to schedule your test drive. While great effort is made to ensure the accuracy of the information on this site, we use an automated feed and vehicle decoding to expedite vehicle distribution to the website. Errors do occur and McCloskey Motors, Inc is not responsible for errors or omissions to the website. Please verify information with a customer service rep. This is easily done by calling us at 719-434-4199 or by visiting us at the dealership. Thank you. Message: Thought you might be interested in this 1984 Buick Regal.